Mad about Mesh -You’ll find lots of uses for these easy-to-make bags, using all the beautiful colors of mesh. Light in weight, mesh provides visibility of contents, ventilation and easy washability. 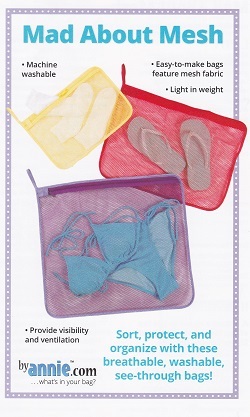 Sort and protect clothing and small items in suitcases or the laundry . Carry toys to the beach and let the sand fall through the holes. Pattern includes instructions for 3 sizes that are ideal for everything from socks to sweaters. Make bags in several colors to sort and organize everthing quickly and easily.